The CIM National Steering Committee (NSC) has appointed new officers and directors, effective July: Executive Director Eugene Martineau, U.S. Concrete (retired); Chairman Michael Schneider, vice president and chief people officer, Baker Concrete Construction; Vice Chairman Michael Philipps, vice president, Business Development, Sandler Training; Secretary/Treasurer Nicole Maher, chief operating officer, National Ready Mixed Concrete Association; and, Immediate Past Chairman Wally Johnson, vice president of Marketing, U.S. Concrete. The NSC board of directors includes Walter P. Moore Principal Randal Beard; Trinity Industries’ Dr. Rex Cottle (retired); Command Alkon Vice President – Customer Success Steve Cox; O’Neal Inc. Vice President, Marketing Brian Gallagher; RMC Research & Education Foundation Executive Director Julie Garbini; American Society of Concrete Contractors Executive Director Beverly Garnant; California State, Chico CIM Patron Chairman Douglas Guerrero; National Precast Concrete Association Vice President of Education & Training Marti Harrell; Construction Insight Senior Associate Scott Harrison; Sika Executive Vice President, Concrete & Waterproofing Kyle Loyd; Ozinga RMC Inc. Executive Vice President Paul Ozinga; Summit Materials Director of RMC Performance Aaron Snowdon; American Concrete Pipe Association President Russell Tripp; and, Informa Exhibitions U.S. Editor Rick Yelton. Concrete Products covers the issues that attract producers of ready mixed and manufactured concrete. 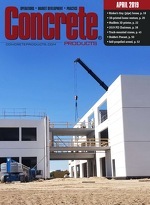 With an editorial focus on equipment and material technology, market development and management topics, Concrete Products provides practical information for management professionals on how to run their day to day business. Click here to visit SEMCO Publishing for more industry news publications. © 2017 | All rights reserved.